Semporna is a world away from Mabul, the water brown with the saddening site of floating litter, clapped up cars chugging through the streets and daily life passing by for many fish and fruit sellers lining the street. 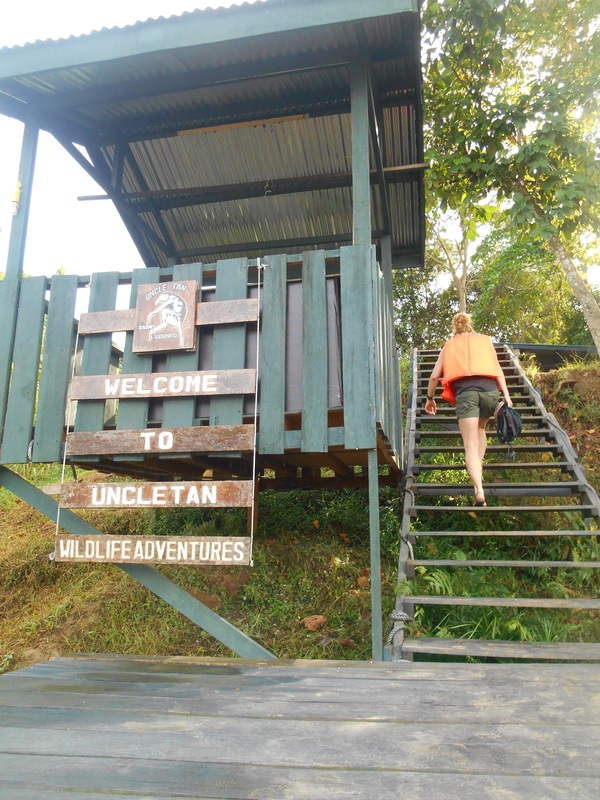 As Colin and I had both planned to travel on to Sepilok junction to visit the Kinabatangan River and jungle, We needed to spend the night in the town. With a rather different sunset experience to the previous nights we had dinner on the water front. Our very young and keen waiter struggled to understand our order but maintained a grin throughout, so a pleasant surprise when the meals turned up, even with a few expected surprises. The evening temperature barely falters from the heat of the day and we got ice cream and joined others on the bustling wharf to listen to a band who were performing music outside. The drummer had little more than a symbal but it didn’t dampen any enthusiasm as the singers grappled with the high notes. In the morning we made our way through the dirty alleyway of fish, fruits, knock off films and indescribable smells, passed the sleek contrast of the blue mosque to the bus station and after a light breakfast boarded a highly civilised air conditioned coach north towards the Sepilok Junction. Every time the bus pulled over food vendors clambered onto the bus, packets of crisps tied together on coat hangers and stray lengths of rope. I realised a flaw in asking “what is that?” in the local language, as if the reply wasn’t banana or rice I was pretty stumped and had to nod and walk away. Colin however purchased bus snacks Borneo style, fried strips of banana and a multi pack of wafers. With some confusion our bus was going to drop us a little further than our destination. After confirming this with the driver several times we were booted off roadside where a smaller, basic mini bus would get us a little closer. Adorned with stickers of Che Guevara and Hello kitty, the open window took the place of air con and a small boy came around to check your destination and collect your fare. About 40 minutes later we were once again pointed in the right direction, junction mile 14, and began a short walk to Uncle Tan’s, the tour operator who would take us into the junction and just in time, it was lunchtime! At about 2pm we had our briefing from Jeff. He wasn’t one to reassure or comfort as we first heard that the water levels in the river were low due to no rainfall for 3 months. Despite not needing rain gear, it would be more difficult to find the animals who would have gone elsewhere to find water. He then continued to list off that our huts were basic and had occasional unwelcome visitors, rats. At this point he gesticulated with his hands a rather sizeable rat size, bigger than most of the Asian cats. Far from gauging the reaction he continued, “who wants to know about spiders?” He then went on to describe spiders the size of your palm, guaranteeing that there were “millions.” He followed this up with centipedes whose bite burn for hours afterwards. I think he was going for managing expectations, but had several of the girls (and any guys that cared to admit it) questioning their choice to enter the jungle. We had an hours drive to the river where we transferred into small canoes holding 6 guests each and all the food we would be taking with us. 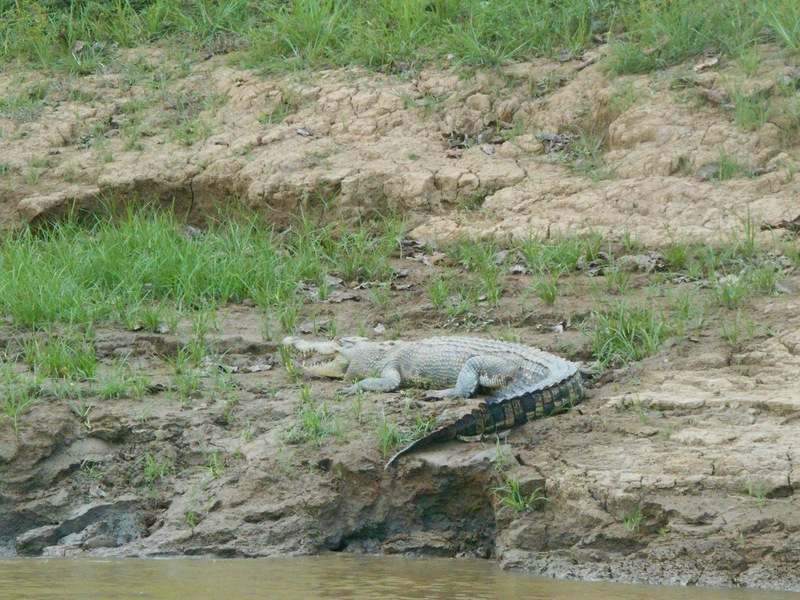 As 11 of us and three guides powered down the river, it wasn’t long before the first crocodile appeared beside the boat. 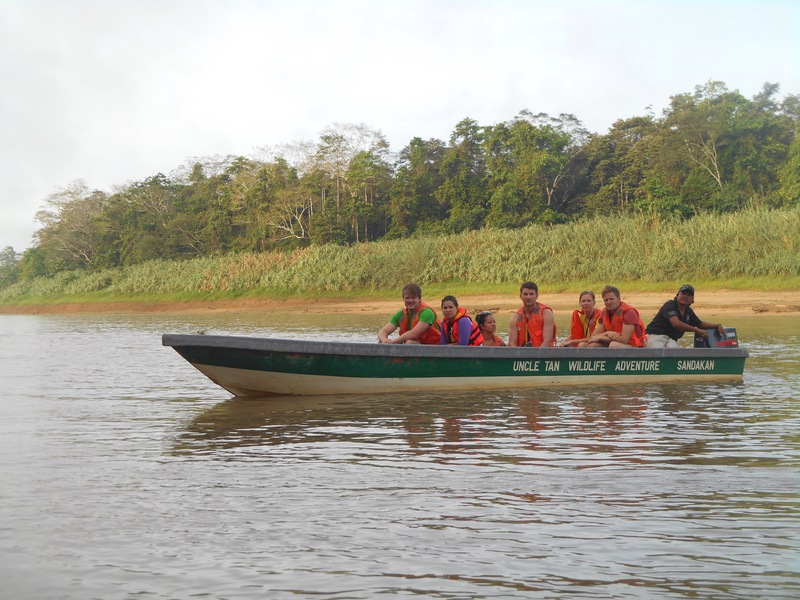 Our journey was filled with wildlife as we stopped to observe short and long tail macaw monkeys, large crocodiles and birdlife. 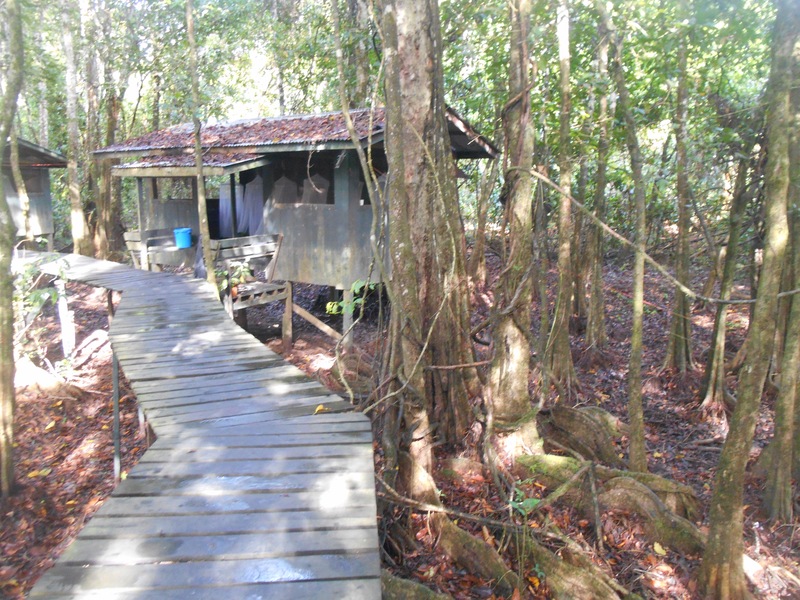 On the riverbank, we followed a boardwalk to the accommodation, mattresses on the floor of open cabins, a mosquito net the protection from the wild outsides. 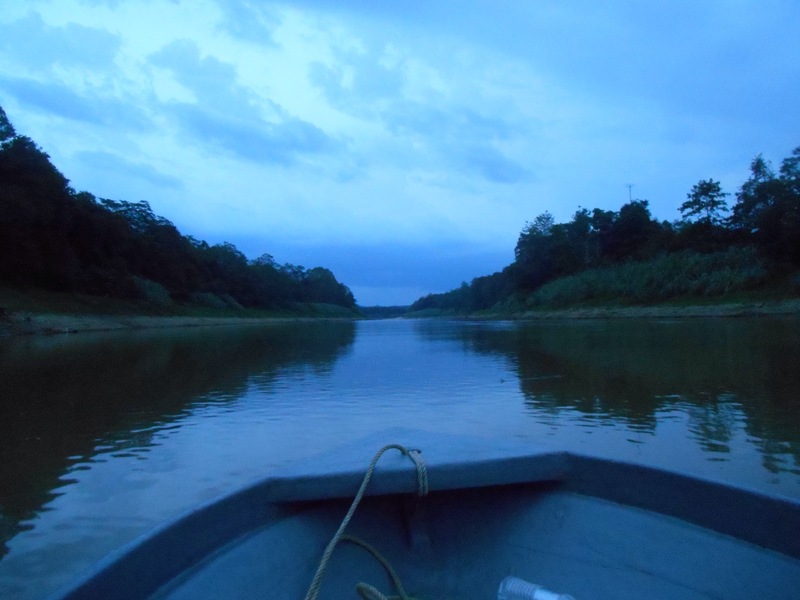 We got back in the boat to go out on our evenings river safari. 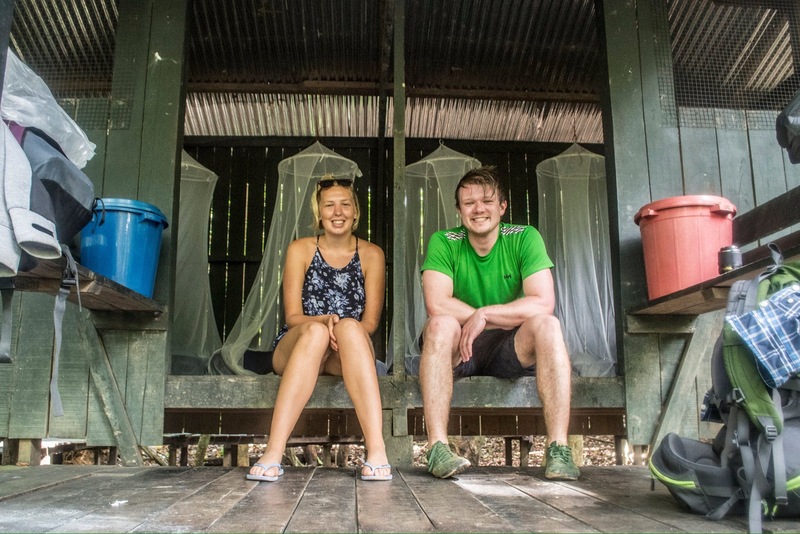 It wasn’t long before we found some proboscis monkeys. Unique to Borneo, they have a slightly orange back and shoulders the males of this species have a long nose. 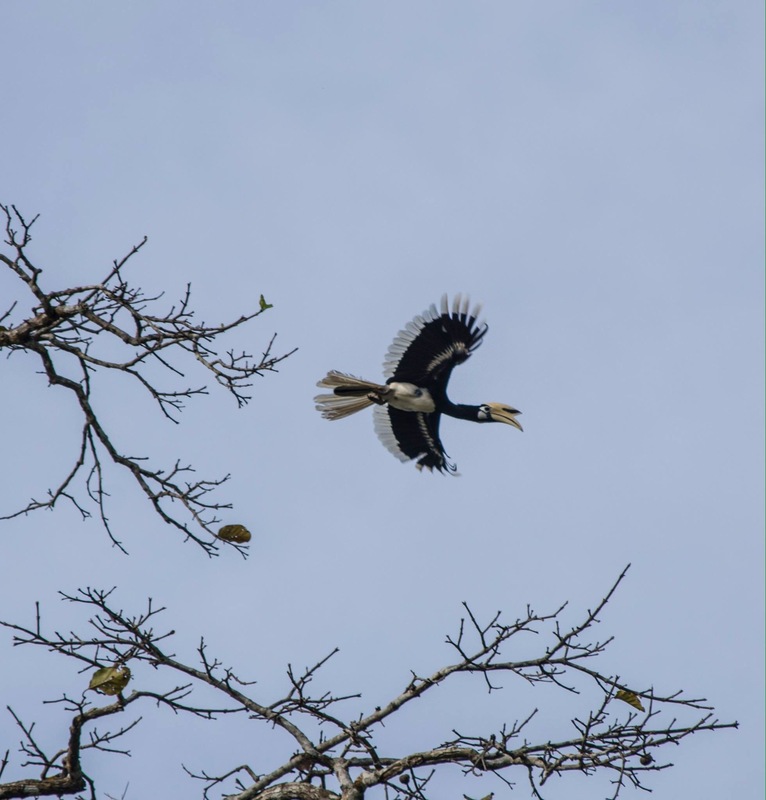 Whilst the other boat got an in detail description of their diet and nature, our guide struggled with English and said things like, “do you know why they are in the tree? Because that’s where they live.” Insightful. The sun set quickly and we were exploring in the dark, lightening flashes lightening the sky. Despite Jeff’s guarantee, the heavens opened and we were soon drenched, quickly speeding back to camp. 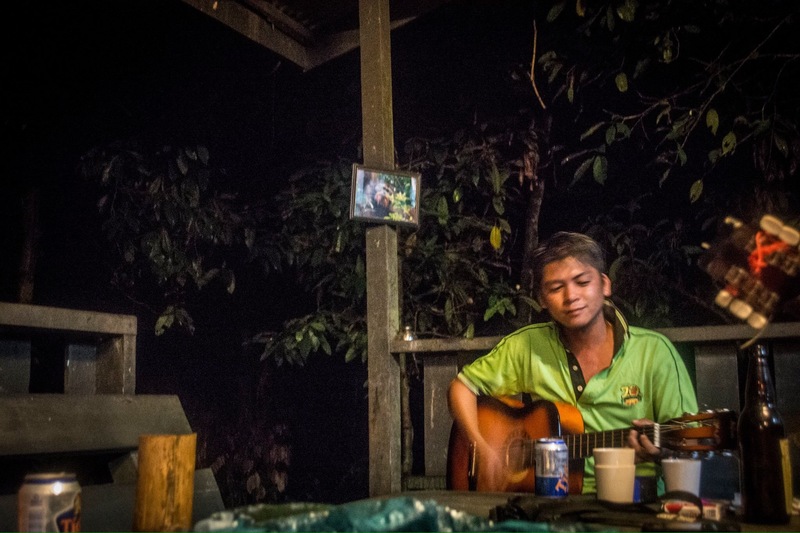 The night was then spent in the communal shelter playing cards, sharing stories and being entertained by a three man band, one with a tambourine, one a guitar which he was pretending to play and one with a great voice but an interesting take on the lyrics of each song. At about ten to midnight we retired all retired to bed ahead of the generator going off and leaving us all in the dark until midnight. On my trip to the toilet I saw one of the Palm sized spiders and vacated quickly. 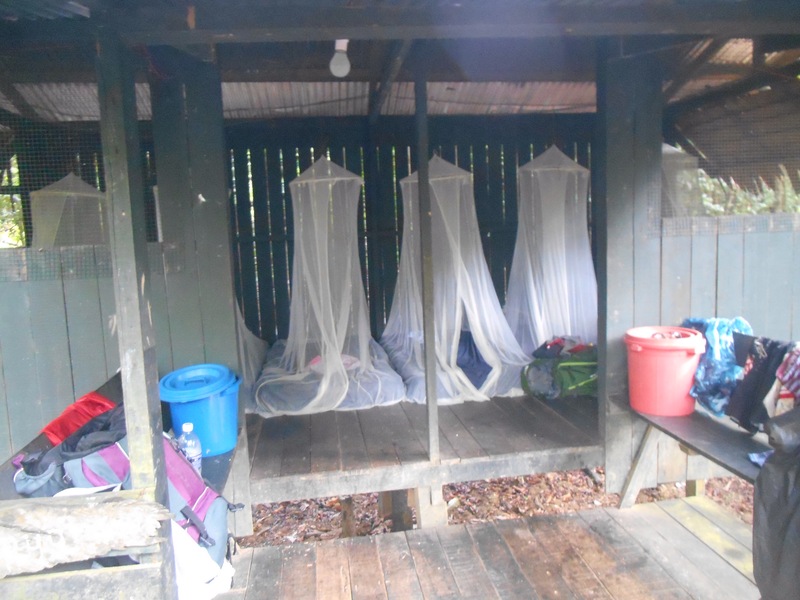 We were encouraged to sleep by the sounds of frogs, birds and jungle life. It was an early wake up at 5:30 for a morning river safari. Some of the group hadn’t managed to sleep, however I’m blessed with the coma like ability to sleep anywhere. 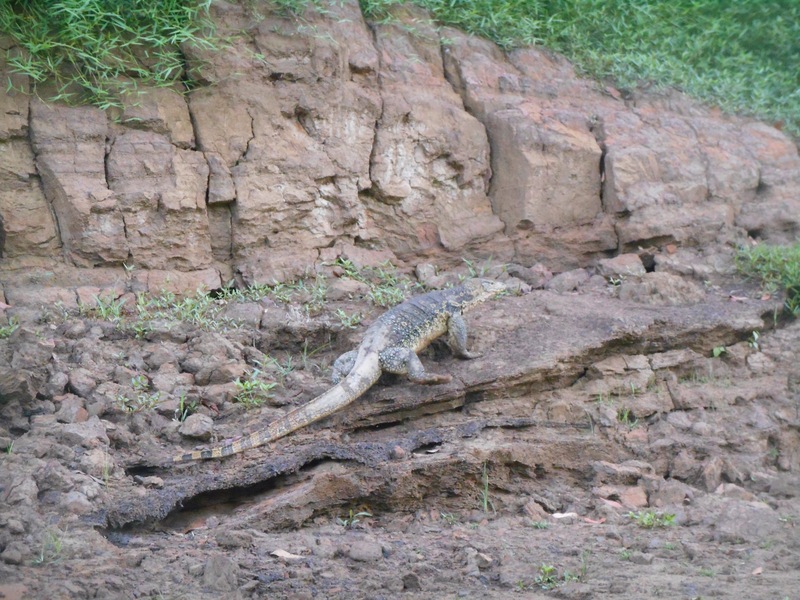 Down the river we spotted large crocodiles, slick with their stealth like movements. 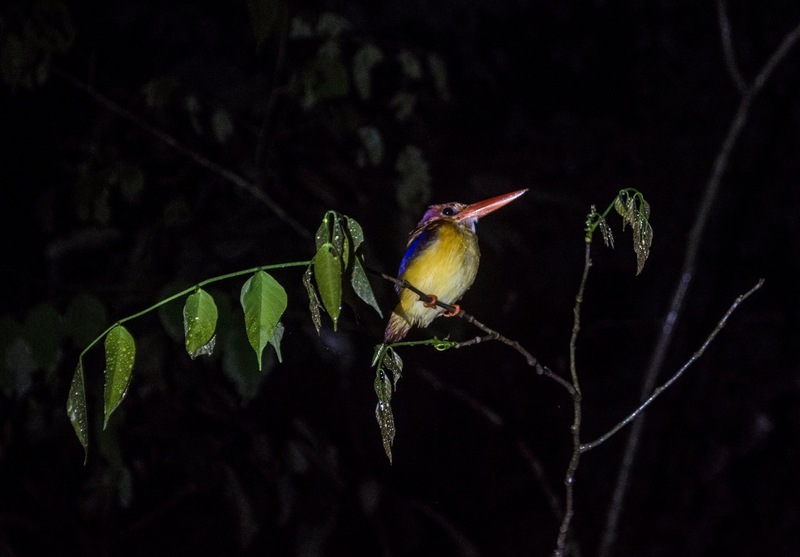 There was also kingfishers, Eagles, hornbills, more monkeys and a few glimpses of orangutangs! 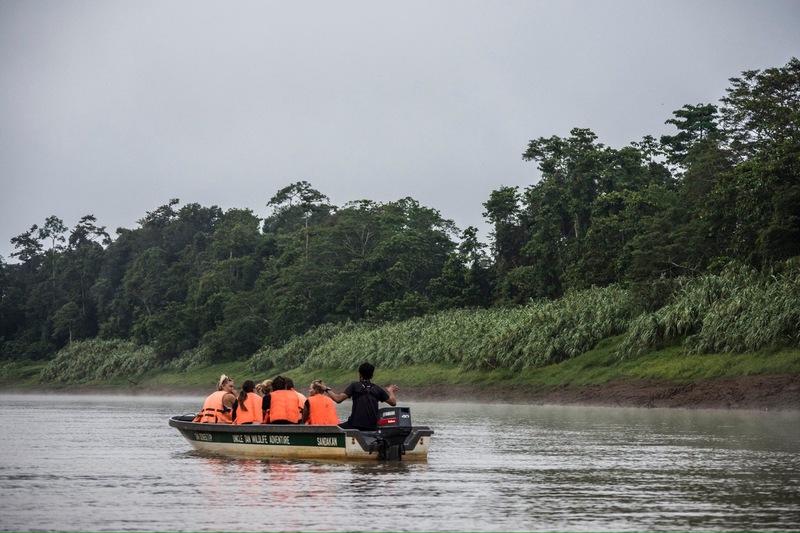 Parts of the jungle looked bare, behind the river giving way to private land or large Palm oil plantations. Although this was mentioned several times and is the largest income to the country, it is obviously highly destructive to the ecosystem and forest life including orang utangs and it was hard to gauge what the feelings of the local people were towards it. 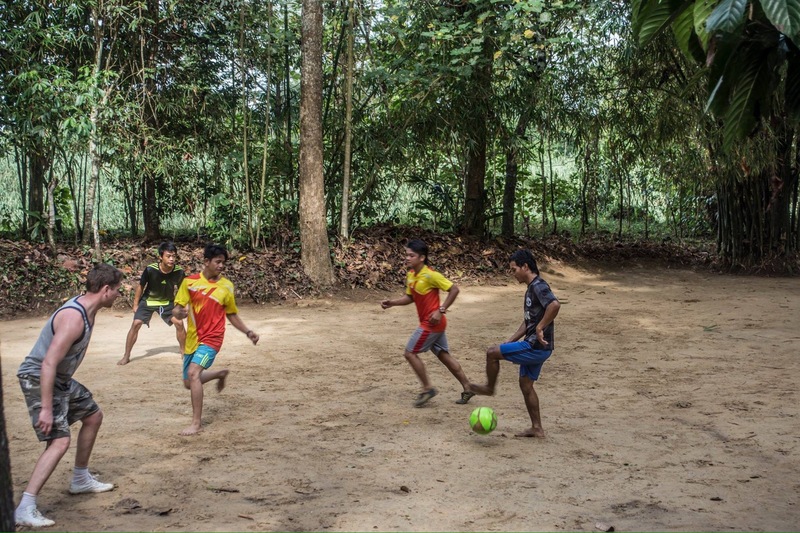 After breakfast some of the boys from the group took on the local staff in a game of football which in the humidity had soon raised a few temperatures as it was taken very seriously by both sides. All too soon it was time to say goodbye to the jungle and make our way back up the river and onwards. At the operations base back in Sepilok it was time for goodbyes. I washed the sunscreen, insect repellent and sweat from my skin and headed for the airport. And just like that, the kilometres I have been collecting over the last few years were undone as the plane sped back into the northern hemisphere, over Europe and landed in London. After 947 days away I boarded the plane, jittery with excitement and nerves. The better photos were taken by Colin McMorrin who is very talented at taking envy inducing photos on his travels and at home in Scotland. Torture yourself further by following his Instagram @colin_goes88, who knows, maybe one day you’ll see him in Nat Geo.